Borror Properties is taking its successful blueprint for vibrant urban developments from the Short North to Downtown Columbus with its newest project, 303 South Front Street. Centrally located in the RiverSouth district near the intersection of Front and Main streets, the development will transform a former nightclub site into a 89-unit apartment building with five levels of apartments. 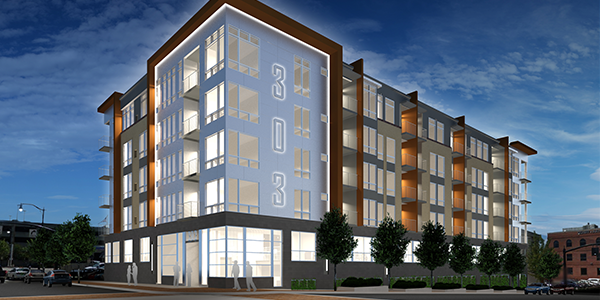 303 will feature a mix of studios and one- and two-bedroom units. Just as Borror’s Short North developments are integrated seamlessly into their urban neighborhoods (check out Truberry on Summit in Italian Village and 40 West in Victorian Village), 303 South Front will complement the growing RiverSouth area. Residents will be just blocks from the Scioto Mile, newly revitalized with 145 acres of parks, boulevards, bikeways and pedestrian paths stretching along the banks of the Scioto River. The neighborhood is home to restaurants including Milestone 229, attractions such as the Cultural Arts Center, and also hosts annual events including Jazz and Rib Fest, Rhythm on the River, and the Grand Illumination. Construction is scheduled to begin this summer on 303 South Front Street. Borror Properties is a privately owned, multi-faceted Real Estate Developer based in Dublin, Ohio. Their mission is to provide every customer with a superior real estate product and legendary customer service. Borror Properties has four divisions: Urban Development, Construction, Property Management, and Commercial Brokerage. Through its apartment and association management arm, Borror Properties manages over 13,000 units in Central Ohio. For more information about Borror Properties, contact Lori Steiner at lsteiner@borrorproperties.com or call 614-356-5502.